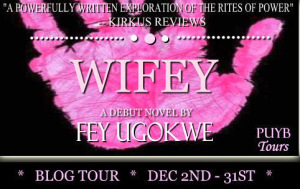 Today, Authors to Watch is thrilled to be part of the Wifey Blog Tour by Pump Up Your Book! The author, Fey Ugokwe, is here to answer a few questions about her book. Enjoy! A: So, in forever yesterdays, somewhere in a new section of Old Virginny, I was perched in the here-there-and-everywhere-strewn, starter apartment of a young male cousin of mine and his twentysomething wife--both relatively recent and flag-flying Greek Life college alums, like the main characters in my book. And there I observed the former, eyes twinkling, refer to his spouse as "wifey". I thought it pretty cool the way the word slid so smoothly down his tongue and big-boy-playfully out, from one smirking corner of his mouth--but it touched off an adverse wonder in my head, that eventually, in part, gave birth to my book. I specifically began almost viscerally pondering about some other households in the nation, wherein the term "wifey" was perhaps being conversely used to demean, diminish, destroy. Fast forward the pop culture clock, and "wifey" is now seamlessly a part of the contemporary parlance, referring to everything from indeed a wife, to a seven-star girlfriend or seriously should-be-spouse acquaintance/stranger. And it was just that--the term's continuing use and its expanded, 2013 reality--that gave rise to the storyline idea dough for my little work of contempo fiction, Wifey. Q: Can you tell us about your release? A: Wifey walks through real-world, contemporary social and political justice themes, namely those of a dramatic change in socioeconomic status due to domestic/worldwide economic downturn; multicultural gender norms; gender disparity in marriage; domestic violence; multiculturalism and multiracialism; religion; and more. However, I wrote it to encompass and not to wedging, shove back--so it’s meant to eat light and lingeringly, and to seek, find the common or compassionate bud on you. Deliberately spliced with moments of real-world humor, and blended with an array of cultures beyond those that pop up in its excerpts, it attempts to ask the ‘what if’--in a time that was smartingly not too far removed from now. Q: Of all your characters, which one is your favorite? A: All of my characters in Wifey have a mini me rummaging about within them--at least as regards their mother-approved extracurricular activities and behavior. So, as between blissfully-blended chocolates freshly popped onto a come-hither doily, it would be tough to tap, fave, claim, just one. Now, where some of them have clearly belly-flopped into the deepest of ends, I can only state that quite clearly, re-baptisms, full-immersion holy oil anointings, and a seemingly ceaseless run of astringent, self-help seminars are perhaps well in order, followed by some sort of unreasonably public 're-setting' ritual. Q: Describe your writing process. When and where did you write? A: Wifey was primarily penned flat on my smarting back at all unlivable hours in my bed, draped long-limbed over seeming, lifetimes-accrued-uncomfy hospital chairs, and tuckered, in full-running Park, with the windows cracked open and my nose mashed up against the lid of a Tall whatever-whathaveyou from Ye-Olde-Saint-Starry-bucks--in between the time that hobbled about the devastation that then was. A: I would love to tongue-and-tell here, re: future works (or more appropriately sometimes, given my life's grayscale realities--'kiss-and-kvetch'), but my maternal Grandmum did teach me to keep a good secret's mouth well shut, and I am also, essentially, yet at the freshly-cracked-egg stage of my career. So, suffice it to say, since many of us writers were almost literally birthed ruminating and reducing all down, the principles of probability says I've likely definitely developed some sort of a backlog, somewhere of sorts. And I think I’m going to have to, with a wink and brow-raise, leave it at that for now, lest I be visited by Grandmum’s disapproving apparition--as she was always in my pure, younger life, only half-jokingly threatening to one day do.